1,006 pages | 345 B/W Illus. The rapid introduction of sophisticated computers, services, telecommunications systems, and manufacturing systems has caused a major shift in the way people use and work with technology. It is not surprising that computer-aided modeling has emerged as a promising method for ensuring products meet the requirements of the consumer. The Handbook of Digital Human Modeling provides comprehensive coverage of the theory, tools, and methods to effectively achieve this objective. The 56 chapters in this book, written by 113 contributing authorities from Canada, China, France, Germany, the Netherlands, Poland, Sweden, Taiwan, UK, and the US, provide a wealth of international knowledge and guidelines. They cover applications in advanced manufacturing, aerospace, automotive, data visualization and simulation, defense and military systems, design for impaired mobility, healthcare and medicine, information systems, and product design. The text elucidates tools to help evaluate product and work design while reducing the need for physical prototyping. Additional software and demonstration materials on the CRC Press web site include a never-before-released 220-page step-by-step UGS-Siemens JackTM help manual developed at Purdue University. The current gap between capability to correctly predict outcomes and set expectation for new and existing products and processes affects human-system performance, market acceptance, product safety, and satisfaction at work. 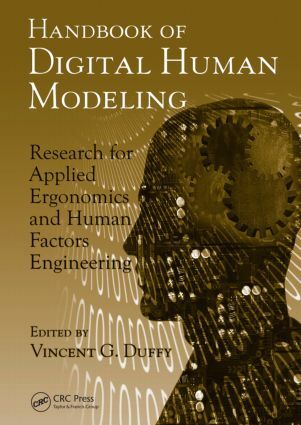 The handbook provides the fundamental concepts and tools for digital human modeling and simulation with a focus on its foundations in human factors and ergonomics. The tools identified and made available in this handbook help reduce the need for physical prototyping. They enable engineers to quantify acceptability and risk in design in terms of the human factors and ergonomics. Digital Human Modeling for Palpatory Medical Training with Haptic Feedback, R.L. Williams II, J.N. Howell, and R.R. Conatser, Jr.